The following post is part of our Law Student Blog Writing Project, and is authored by Madelyn Stampley, a law clerk at Lawrence and Associates, who is pursuing her Juris Doctorate at NKU Chase College of Law. Sadly, in today’s economy, a lot of Kentucky and Ohio residents are only able to afford car insurance with minimum coverage, or worse they are unable to afford car insurance at all. When one of these underinsured or uninsured drivers are at-fault for a motor vehicle accident that caused you injuries, underinsured (UIM) and uninsured (UM) motorist coverage allows you to fully recover. 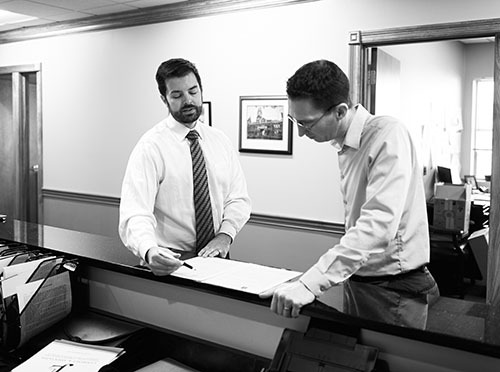 Securing an attorney for your UM or UIM claim is crucial to just compensation for your harm and damages. Can I Still Get Compensation from a Motor Vehicle Accident if the Other Party in the Accident Does Not Have Insurance? Both Kentucky and Ohio law allow you to get compensation from a motor vehicle accident if the other party in the accident does not have insurance. Uninsured motorist coverage provides protection when you are in a motor vehicle accident and the responsible party does not have auto insurance and this cannot cover repairing your car or covering your medical bills and lost wages. UM is important because it is the only way to know your damages are covered in an accident with an uninsured motorist. An uninsured motorist is more likely than not uninsured due to not having the funds to afford auto insurance. If they do not have the funds to afford insurance, they most likely do not have enough money to cover expensive medical bills, lost wages, and your automobile repairs. Why Is It Okay to File an Uninsured Motorist Claim? An uninsured motorist claim can help ensure your medical expenses (medical bills, lost wages, and pain and suffering) are paid for when you are in a motor vehicle accident with an at fault driver that does not have auto insurance. It is not only okay, but it is recommended to have uninsured/underinsured coverage. In some states uninsured motorist coverage is mandatory, although in Ohio and Kentucky it is only optional. Uninsured motorist coverage also covers you if you are the victim of a hit-and-run accident. What is Underinsured Motorist Coverage and How Can It Protect Me? Underinsured Motorist Coverage, or UIM, provides you protection when you are in a motor vehicle accident and the at-fault driver does not have enough auto insurance coverage to fully cover repairing your cap or covering your medical bills, pain and suffering, and lost wages. For example, let’s say you are a Kentucky resident in a motor vehicle accident that accrues $200,000 worth of damages. The at-fault driver has insurance, but it only covers $100,000 of the damages. In this case you can make an underinsured motorist claim against your own insurance policy. If you had $150,000 in underinsured driver coverage, you would settle with the negligent driver for $100,000, and would settle with your insurer for an additional $100,000. Your auto insurance policy is required to cover all the damages you have that exceed the amount covered by the at-fault driver’s policy, up to the limit of the UIM coverage reflected on your auto insurance declarations page. In contrast, in Ohio your available UIM coverage is based on the difference your UIM limits and the underinsured driver’s liability limits. For example, if the underinsured at-fault driver has $25,000 in liability limits, and you have $100,000 in UIM limits, you would be able to collect up to $75,000 from your own UIM policy ($100,000 – $25,000 = $75,000). This is because Ohio law allows a UIM policy to be offset by the at-fault driver’s liability coverage, instead of requiring that UIM coverage stacks on top of the liability coverage as it does in Kentucky. How Do I File an Uninsured or Underinsured Motorist Claim? If you are in a motor vehicle accident, it is important to start taking the proper steps immediately to make sure your claim goes your way. Generally, you will know if the at-fault driver is uninsured once the police are called to the scene after the accident. On the other hand, knowing if the at-fault driver is underinsured tends to be more difficult and time-consuming. It can take a while, sometimes several months, to determine the amount of money needed to cover the damages due to the motor vehicle accident. Once this amount is calculated, the at-fault driver’s insurance will cover as much as their policy allows. After the insurance limits are reached, you should contact your insurance company or attorney to file an underinsured motorist claim. The key to filing either of these claims is acting swiftly to make sure claim runs smoothly due to a lot of car insurance policies having limits on how many days you have to report the claim. Once you have filed your claim, there will be pretrial investigation, disclosure of medical records, and settlement discussions. Generally, the insurance company and your attorney will discuss and negotiate the best possible settlement for you. Due to financial struggles, a lot of Kentucky and Ohio residents decide to purchase auto insurance policies with minimum coverage. A shocking amount of people also decide to forego auto insurance completely. To ensure your insurance covers your medical bills, lost wages, pain and suffering, and vehicle damages during a motor vehicle accident with an uninsured or underinsured driver, it is important to have UM or UIM coverage. If you find yourself post-car accident unsure how to make sure all your damages are covered, securing an attorney is the best way to proceed. Having an attorney during this process will ensure that you will have the best possible result and have your damages covered. If you decide to not obtain uninsured or underinsured motorist coverage, you are driving at the mercy of everyone on the road who does not have insurance or is underinsured. While it may be more expensive, you should view it as a stress taken off your shoulder knowing that you have enough insurance coverage to cover medical bills, lost wages, pain and suffering, and car repairs. If you have been in a Car Accident in any state, or if you have any other questions about Underinsured or Uninsured Motorist coverage, please call our Fort Mitchell, Kentucky office at 859-371-5997 or our West Chester, Ohio office at 513-351-5997. We successfully resolve hundreds of cases every year for people who are in your shoes. We’re Working Hard for the Working Class, and we want to help you!